Simple demo of QRcode + ARtoolkit + ArUco markers detection and decoding. The three algorithms run in parallel. You should be able to sustain 50 frames/s at 320x240 camera resolution, and 20 frames/s at 640x480 camera resolution. This module can send standardized serial messages as described in Standardized serial messages formatting. When dopose is turned on, 3D messages will be sent, otherwise 2D messages. One message is issued for every detected marker, on every video frame. id: decoded marker ID (with prefix 'U' for ArUco, or 'A' for ARtoolkit), or type of symbol (e.g., QR-Code, ISBN13, etc). extra: none (empty string) for ArUco and ARtoolkit markers, otherwise decoded barcode or QRcode content. If you will use the quaternion data (Detail message style; see Standardized serial messages formatting), you should probably set the serprec parameter to something non-zero to get enough accuracy in the quaternion values. See Standardized serial messages formatting for more on standardized serial messages, and Helper functions to convert coordinates from camera resolution to standardized for more info on standardized coordinates. Definition at line 85 of file MarkersCombo.C. Definition at line 91 of file MarkersCombo.C. References itsARtoolkit, itsArUco, and itsQRcode. Virtual destructor for safe inheritance. Definition at line 101 of file MarkersCombo.C. Processing function, no video output. Definition at line 107 of file MarkersCombo.C. Processing function with video output to USB. Definition at line 136 of file MarkersCombo.C. 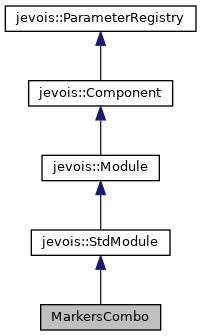 References jevois::rawimage::convertToCvGray(), jevois::rawimage::drawFilledRect(), jevois::RawImage::fmt, jevois::RawImage::height, itsARtoolkit, itsArUco, itsQRcode, JEVOIS_REGISTER_MODULE(), jevois::rawimage::paste(), jevois::RawImage::require(), jevois::Timer::start(), jevois::Timer::stop(), jevois::RawImage::width, and jevois::rawimage::writeText(). References jevois::rawimage::convertToCvGray(), jevois::rawimage::drawFilledRect(), jevois::RawImage::fmt, jevois::RawImage::height, itsARtoolkit, itsArUco, itsQRcode, jevois::rawimage::paste(), jevois::RawImage::require(), jevois::Timer::start(), jevois::Timer::stop(), jevois::RawImage::width, and jevois::rawimage::writeText(). Definition at line 210 of file MarkersCombo.C. Referenced by MarkersCombo(), and process(). Definition at line 208 of file MarkersCombo.C. Definition at line 209 of file MarkersCombo.C.